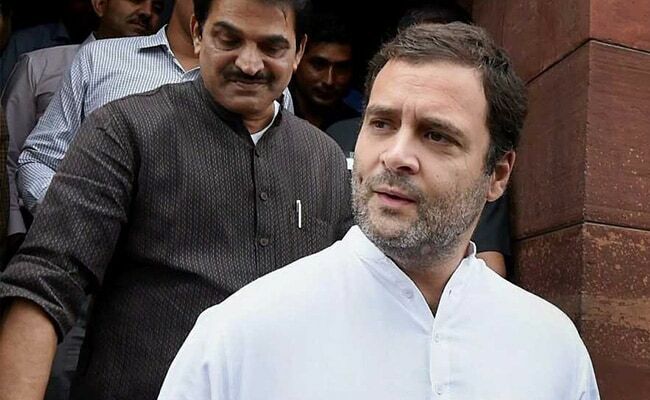 New Delhi: Congress vice president Rahul Gandhi on Tuesday took another swipe at the BJP, tweeting that Jay Shah, the son of party chief Amit Shah, was receiving legal help from the government. A tweet from Mr Gandhi's official handle read, "State legal help for Shah-Zada! Why this, why this Kolaveri Da?" The reference was to a song by Tamil actor, singer and lyricist Dhanush, "Why this Kolaveri di" which had taken the internet by storm five years ago and is still being watched by millions around the globe. The Tamil word, roughly translated, means "murderous rage" - a poke at the BJP, which has been aggressively countering the Congress demands for an investigation into the allegations of crony capitalism against Jay Shah. The businessman has sued the Wire, a website which had made the allegations in a news report, for defamation, demanding Rs 100 crore in damages. The Congress had earlier questioned the propriety of a government law officer representing Jay Shah, who is not part of the government, in the defamation suit. Additional Solicitor General Tushar Mehta had earlier said he was being consulted and might appear in court on behalf of Jay Shah. Amit Shah has said his none of his son's companies "did even one rupee worth of business" with the government or "received kickbacks like in the case of Bofors". Challenging the Congress, the BJP chief has said, "If you have documents to prove your allegations, bring them to court". Mr Gandhi and his party have been hammering away at the BJP over the allegations. During a visit to Gujarat, where elections will be held later this year, Mr Gandhi had said the BJP's pre-Lok-Sabha-election promise of "acche din" had materialized only for Mr Shah and Prime Minister Narendra Modi. Further, referring to PM Modi's remark ahead of the Lok Sabha elections that he would prefer to be the "chowkidar" (watchman) of the country's wealth, the Congress leader had questioned his silence in the matter. Mr Gandhi's attacks have drawn the wrath of a few BJP leaders, one of whom, Siddharth Nath Singh, had said, "Rahul Gandhi should step out of his diapers". Union ministers Smriti Irani and Piyush Goyal have also come to Jay Shah's defence.